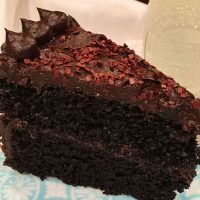 This truly is THE BEST DARK CHOCOLATE CAKE with its moist layers of deep rich chocolate and creamy DARK CHOCOLATE BUTTERCREAM FROSTING that melts in your mouth! It’s AMAZING!!! I spent the next few months…12 of them to be exact…trying to duplicate THAT cupcake! Preheat your oven to 350°. 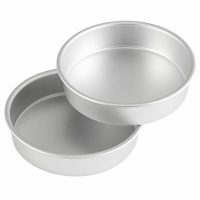 Grease and flour two 9 inch cake pans. 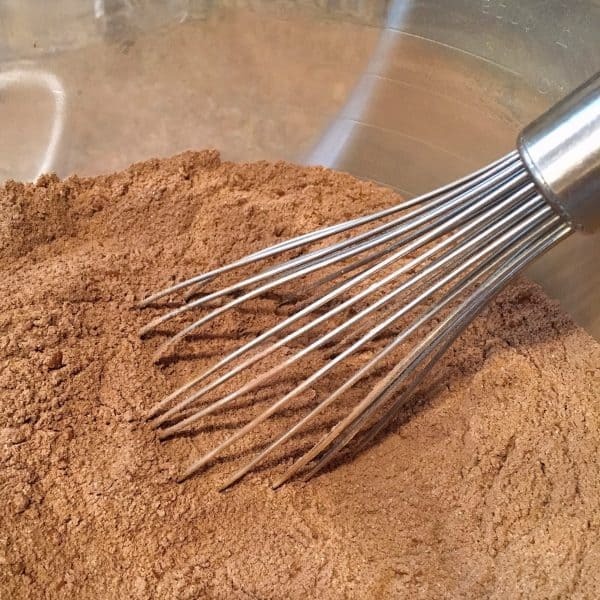 In the bowl of your mixer add sugar, flour, Hershey’s Special Dark Unsweetened cocoa powder, baking soda, baking powder, and salt. You can find all the exact measurements below in the free printable recipe. You’re gonna want to print this one out for your cookbooks! Use a whisk to combine all the dry ingredients. TIP: This helps incorporate all the different elements. Next add 2 eggs, 1 cup of milk, 1/2 cup of vegetable oil, 2 teaspoons of vanilla extract, and one cup of boiling water. TIP: Did you know coffee brings out the flavor of chocolate? It’s true. Coffee brings out the depth of cocoa powder. Now you don’t have to use coffee. I buy the decaffeinated single servings and add it to a boiling cup of water. It will NOT make your cake taste like “Mocha”. I promise. 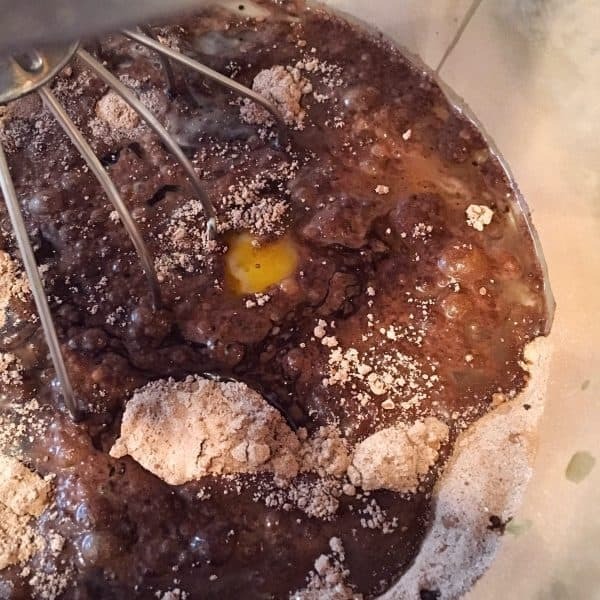 Add one cup of boiling hot water or coffee to the cake batter mixture. Mix on low-speed for 3 minutes until all ingredients are well incorporated. This will be a very wet batter. Do NOT let that scare you! I promise that wet cake batters make wonderfully moist cakes and they will rise. 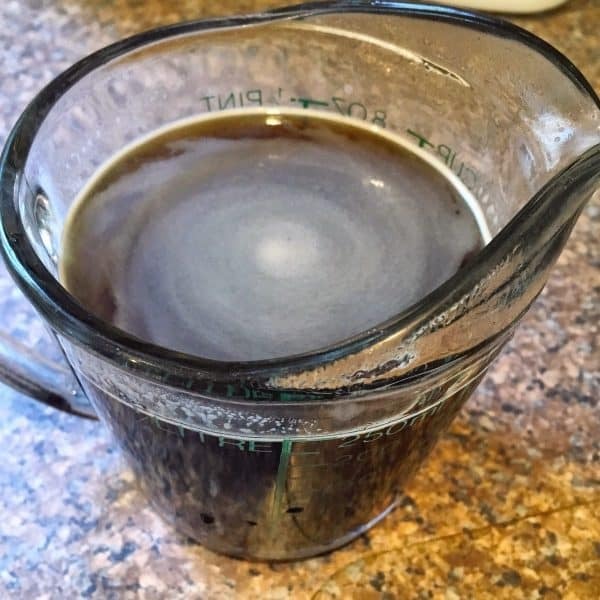 Pour evenly into prepared pans. Bake for 30-35 minutes in preheated 350° oven until toothpick inserted into center of cake comes out clean. I do want to caution that you not OVER bake this cake. Keep an eye on it. 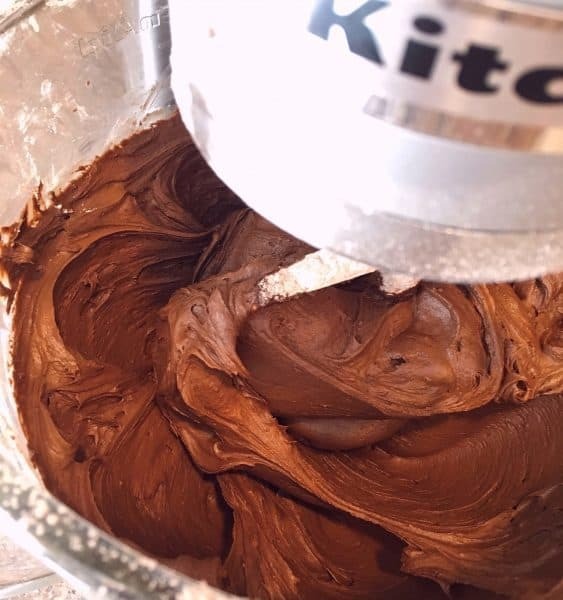 While the cakes are cooling let’s make the scrumptious delectable Dark Chocolate Buttercream Frosting! 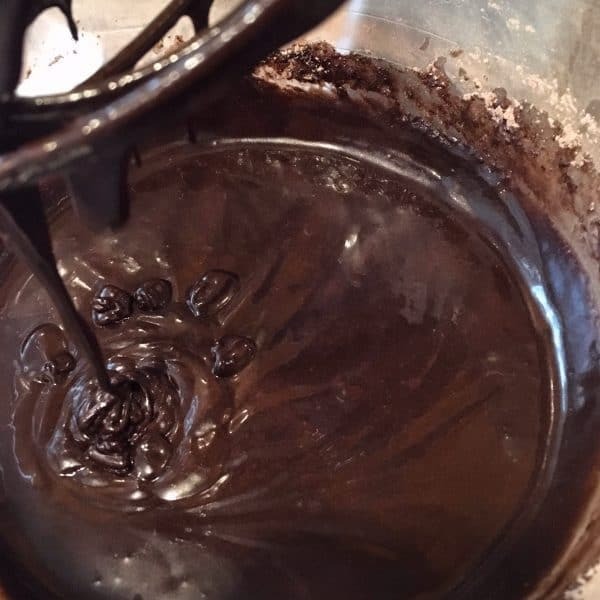 In a fine mesh strainer, over a larger bowl, place 3/4 cups of unsweetened cocoa powder and 3/4 cups of Hershey’s Special Dark Chocolate cocoa powder and 5 1/3 cups of powder sugar. 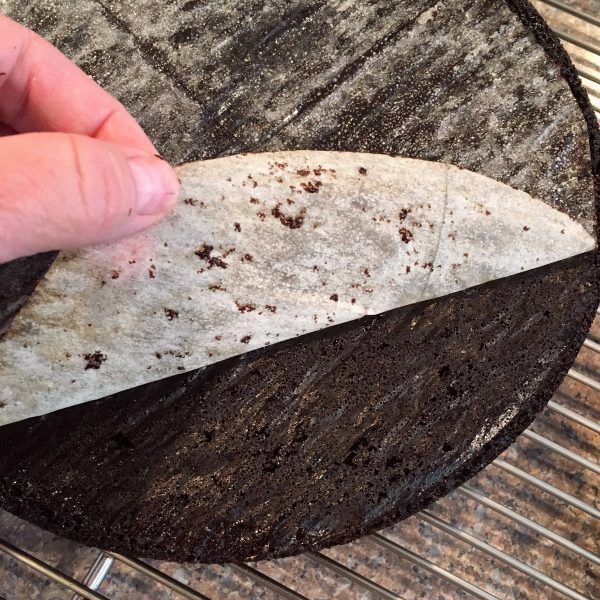 TIP: Gently shake through the mesh strainer. 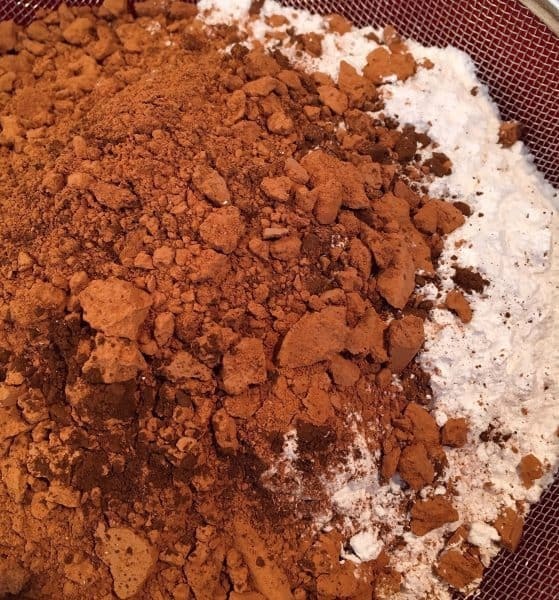 This will eliminate any lumps or clumps of the powder cocoa and sugar. Which will create a smoother frosting. 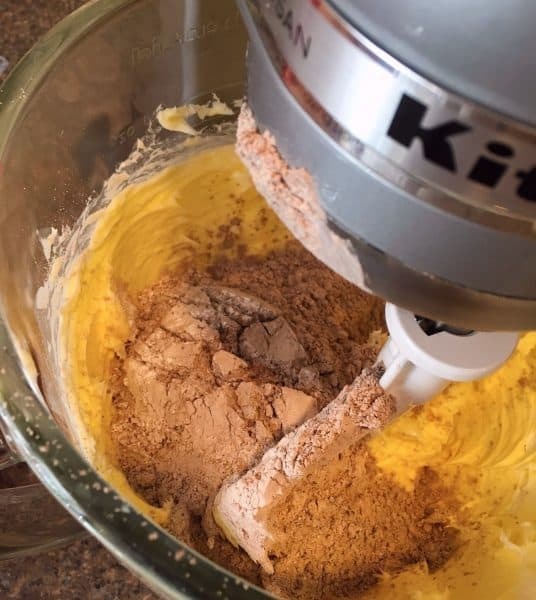 In the bowl of your mixer, with the paddle attachment, cream 3/4 cup of butter until light and fluffy. Add the sifted dry ingredients alternately with the milk and vanilla. Beat until smooth and creamy and the desired spreading consistency. I have to stop here for a second! 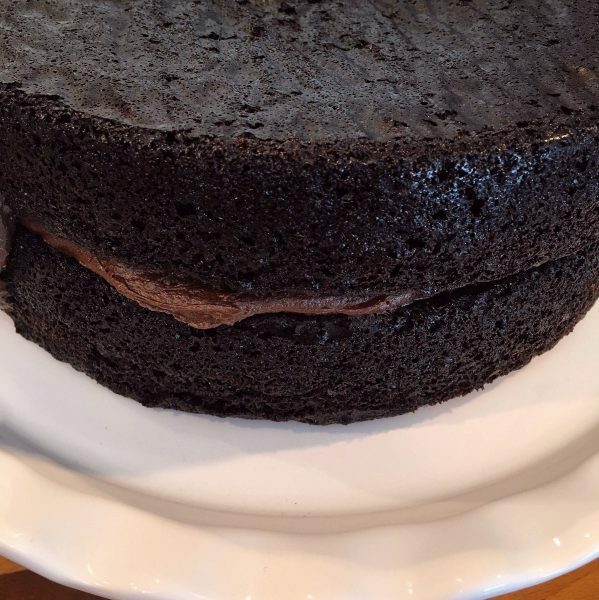 I knew the minute this frosting came together that I had finally recreated that deep dark rich creamy frosting. It’s perfect! I’ll never make another chocolate frosting again. This is it! I could have face planted it in this bowl… and I’m NOT a huge frosting fan! This stuff is addictive it’s so good. Note how nice and smooth the cake is? It’s because you used parchment paper! It’s great at controlling crumbs. 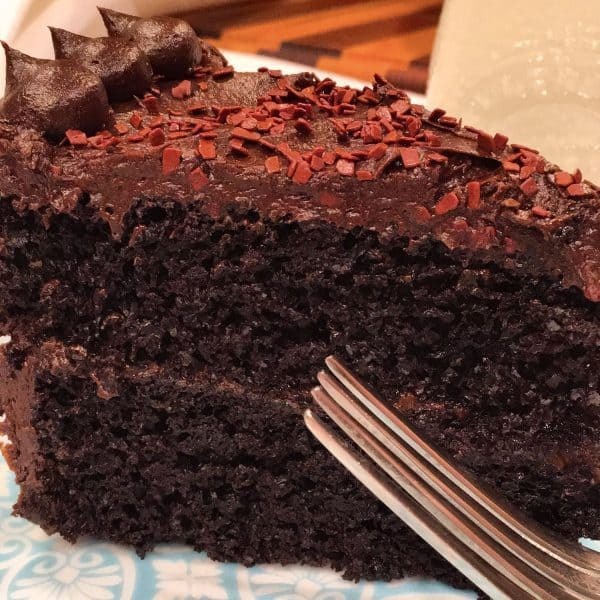 If they serve Chocolate Cake in Heaven…this is it! 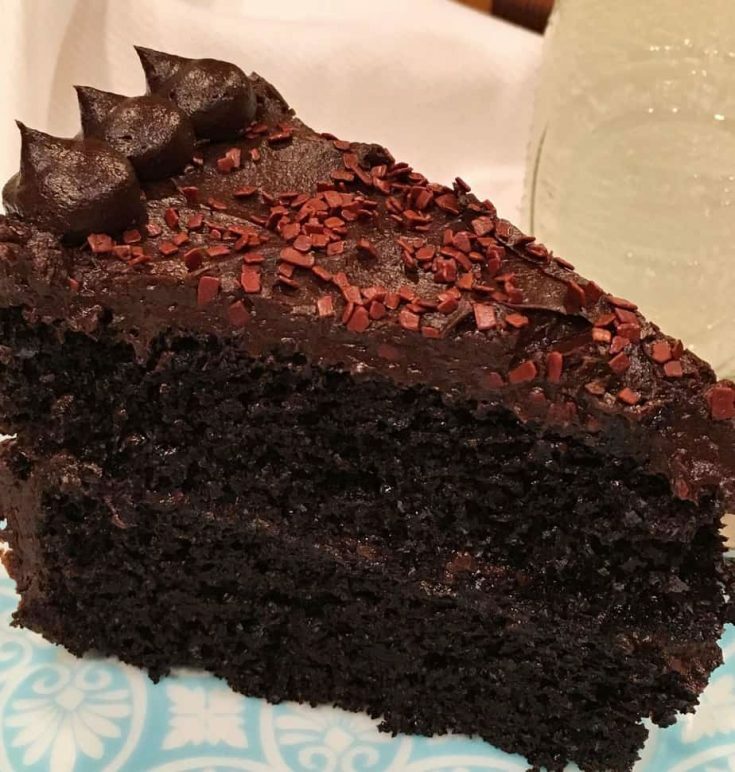 If you love chocolate cake and have been searching for the best recipe around…I hope you’ll give this one a try. I know you won’t be disappointed. It comes together easily and is better than any cake you’ll find at any bakery. We all need a special “splurge” dessert every once and awhile! This is that dessert! Thanks for visiting my Nest! I have more delicious fun recipes heading your way this week. I hope you’ll drop back by and spend a little time with me. I love hearing from you so please feel free to email me or drop a comment below. I’ll get back to you. I care about the food you make for the chicks at your Nest. I am always happy to help when I can! I’m sharing this recipe over on a few of my favorite link parties. Click on the links below to join the fun. Weekend Potluck, Foodie Friday, and Meal Plan Monday! 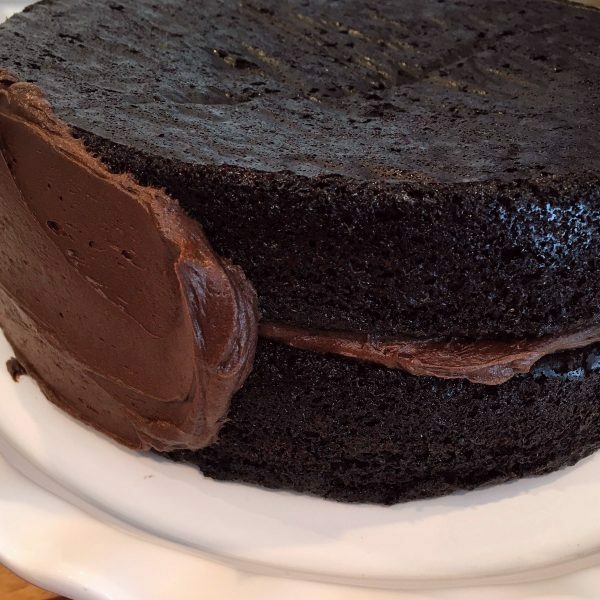 "A rich moist dark chocolate cake with an amazingly creamy smooth chocolate buttercream frosting. This is The BEST Chocolate Cake in the World!" Preheat oven to 350 degrees F (175 degrees C). 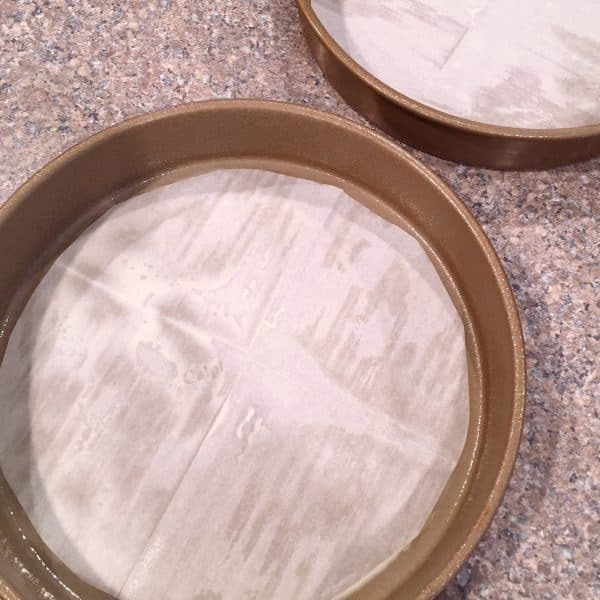 Grease and flour two 9 inch cake pans and place parchment paper in bottom of cake pan. 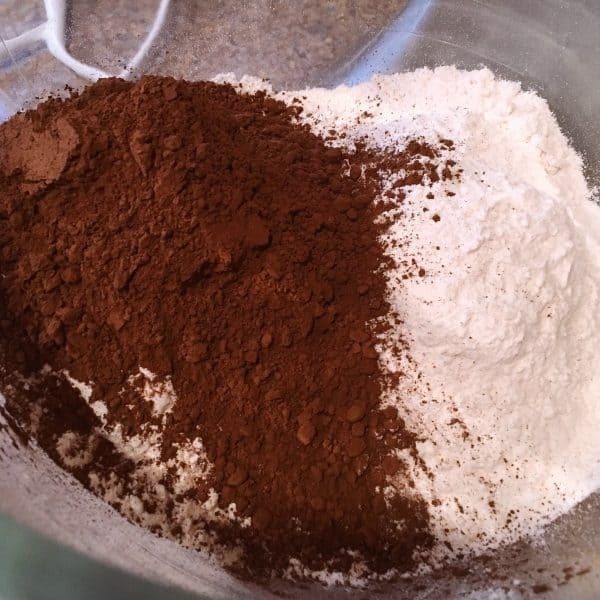 In a medium bowl, stir together the sugar, flour, cocoa, baking soda, baking powder and salt. Add the eggs, milk, oil and vanilla, mix for 3 minutes with an electric mixer. Add in the boiling water or hot decaf coffee. Combine for 1 minute on slow speed. The batter will be very wet. Pour evenly into the two prepared pans. 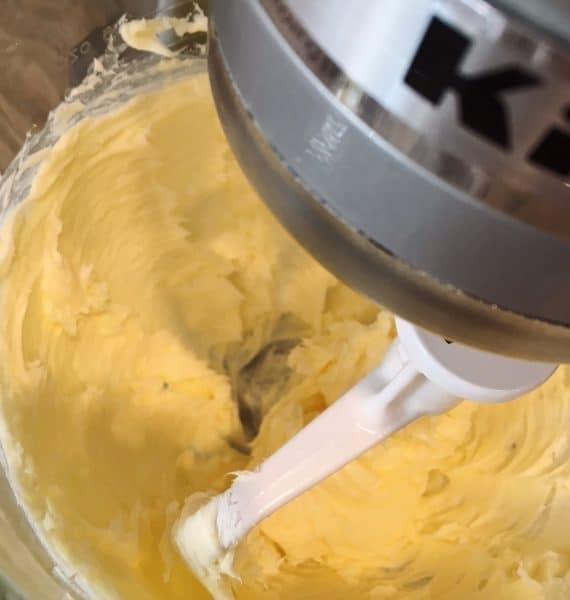 To make the frosting cream butter until light and fluffy. 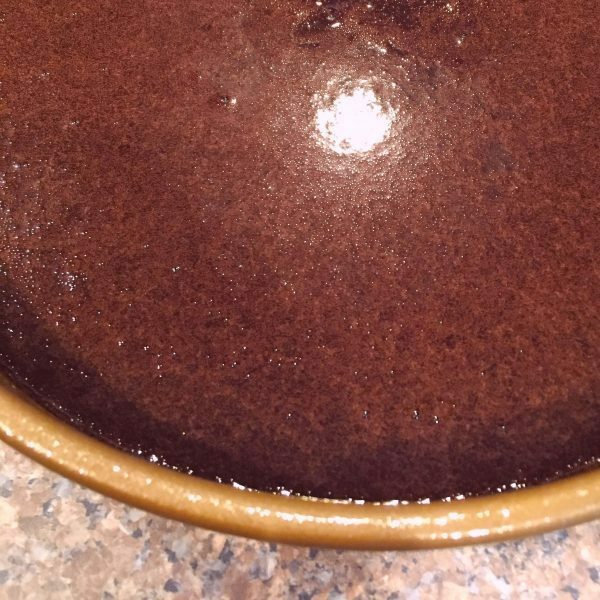 Sift the Cocoa powders and powder sugar in a separate bowl to remove any lumps. Stir in the cocoa and confectioners' sugar alternately with the milk and vanilla. Beat to a spreading consistency. Frost the cooled cake. Cover the top of each layer with frosting place on cake plate. Frost the outside of the cake. You will love this cake! It’s so rich your eyes will roll back in your head! The perfect treat for a Mommy of three. Thanks so much for stopping by and visiting with me. Have a Great Week. First a GREAT big THANK YOU for bringing this to my attention! I need to hire you as my “proof reader”! Yikes! Kind of an important ingredient. Gaaahhhh! It’s 5 1/2 cups of powder sugar. I’ve gone in and added that to the printable recipe. I feel just awful that I missed that when typing this recipe up. It truly is the BEST chocolate butter cream I’ve ever had in my life. I think you’ll love how rich and creamy it is. It looks fantastic. Have you tried making as cupcakes, and if so what was the baking times? I have not tried making them as cupcakes, but feel confident that you could. I would do the baking time around 15-20 minutes. Check them at 15. Don’t let the “wet” batter fool you and over fill the cupcake liners. Fill about 2/3 the way full and you should be fine. Thanks for stopping by and I hope you have a wonderful weekend. Let me know how they turn out. Cupcakes are next on my list with this recipe. I use a cup of coffee to make my chocolate cake too. It does bring out the chocolate flavor like you say. Oh how much I love chocolate cake! I’d marry one if I could!! Shhh don’t tell my husband. Isn’t coffee in chocolate cake the BEST! I absolutely love how it enhances that chocolate flavor….course Dr. Pepper does the same thing when eating chocolate…not saying I’ve done massive research on this…but….lol. Your secret is safe with me regarding the wedding plans. lol Thanks so much for stopping by and I hope you have a wonderful week. 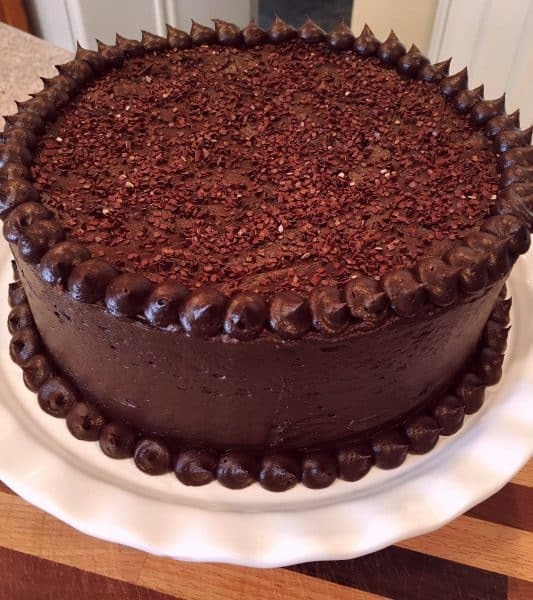 This cake looks fabulous, and my husband LOVES a good chocolate cake. So this is definitely my next cake. By the way, I just made a wedding cake to feed 250+ people and learned a lot from several blogs. One of the best was how to make my own pan coating (1 cup flour, 1 cup Crisco and 1 cup cooking oil mixed together until smooth. No need to refrigerate.) All 16 layers, 6″-14″, slid out of the pans without the slightest problem. I did use parchment paper for the most of the layers. Before, I had used Baker’s Joy, but never again. I love your tip! Thank you so much for sharing with all of us. I can’t wait to try it. 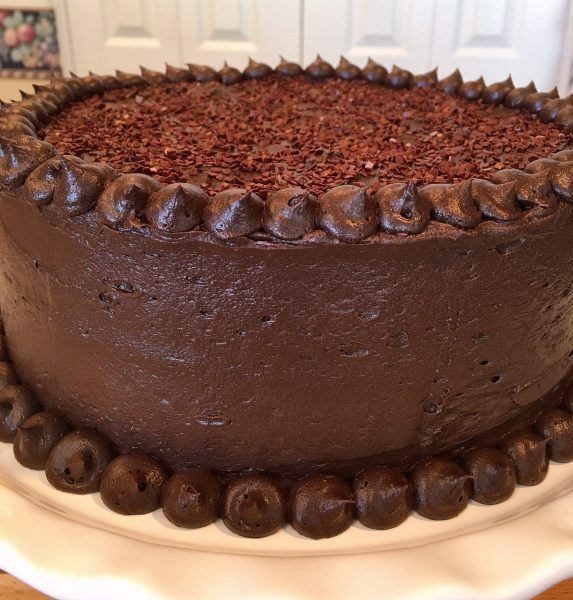 Also, if your husband loves chocolate cake he will love this one. It’s a great chocolate cake and that buttercream is what dreams are made of! Happy Nesting and I hope you have a great week! Thank you for your sweet compliment. 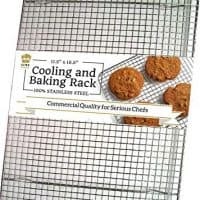 Yes you could make this cake in a 9 x 13 glass baking dish or two 8 inch square glass baking dishes. I’d highly recommend finishing off the frosting with a spoon! I like how you think. lol There really aren’t any changes that you need to make other than the oven temp and time. I’d lower the temp by 25 degrees as glass heats up hotter than the tin and holds the heat longer. Watch the time. You will love this rich chocolate cake. Happy Nesting…Thanks for stopping by! OOPS, I meant Hi, Norine….. Sorry about that, wasn’t paying attention. Love your recipe! Just for you I’m going to try adding the coffee again. I can’t stand the taste of coffee. So far I’ve been able to taste it & hate it..my daughter loves coffee and says the same she can taste it? Weird huh?? Thanks so much for stopping by and sharing with me. Let me know how you like the cake with the coffee. 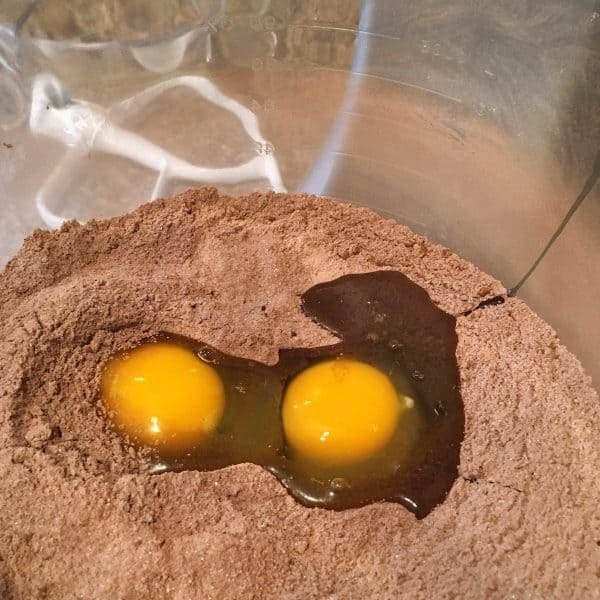 So for the life of me I can not figure out if I just need powdered sugar AND confectioners sugar or just powdered sugar or just confectioners sugar?? Can you please clarify? Thank you! I’m so sorry I have confused you. Just so you know…powdered sugar and confectioner’s sugar are the same thing. Confectioner’s sugar is a term that is used to describe powdered sugar. I should have only used one term and not both. I can see how this would be really confusing. I am so sorry for the mix up. Hope this helps you out.